The substance of the content of magazines has always been important. Each letter of each word formed matters. And when you string those letters together to make words, you then begin to create sentences, followed subsequently by paragraphs, followed by…well; you see where I’m going with this. As the eras have passed, it seems that “substance” has sometimes fallen by the wayside. Vintage words that are weighty and meaningful are often replaced with a group of vowels and consonants that seem flighty and gossamer-thin. Even in the 21st century, content matters, especially in magazines, and especially in this digital age where everything is fast and instantaneous. For those of you who follow my blog, it’s no secret that I have been digging into my Mr. Magazine™ Classic Vault of vintage magazines. And as most of you know, I have what some would call an “extensive” collection. I happened upon a beautiful hardback compilation of McCall’s recently and was struck by the substance of the content. McCall’s Magazine has a rich and lustrous lineage. 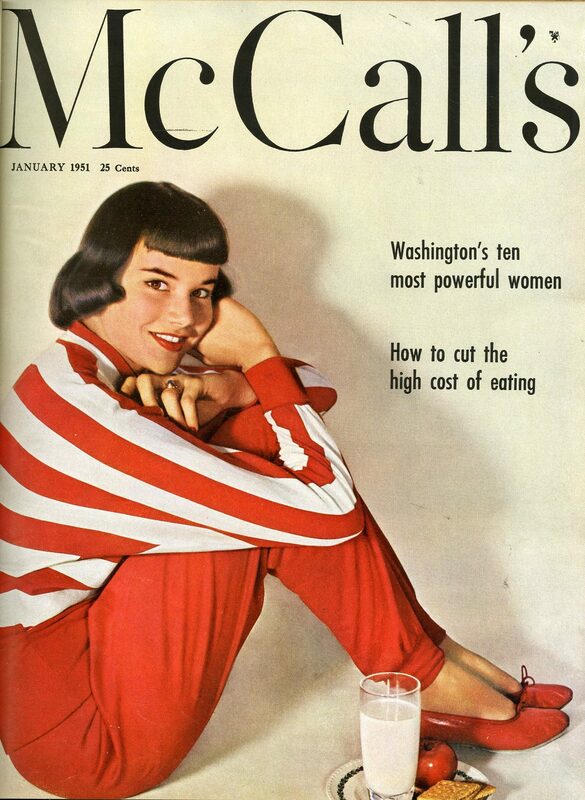 The magazine began as a small-format called The Queen in 1873, and was renamed McCall’s Magazine—The Queen of Fashion in 1897, later shortened to simply McCall’s. During the 20th century it reveled in an abiding popularity with its readers and is known as one of the “Seven Sisters” group of women’s service magazines. McCall’s has always been known for its extremely staunch commitment to service in the women’s category. 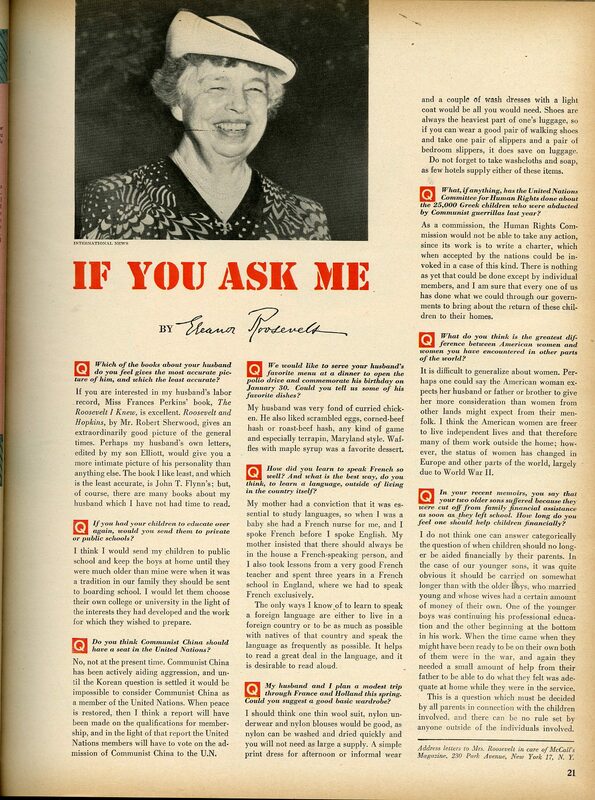 From the Eleanor Roosevelt column entitled “If You Ask Me,” which the former first lady wrote from 1949 until her death in 1962, to the Betsy McCall paper dolls that were printed from 1951 to 1995, and were available in most issues for children to cut out, McCall’s created content that was both service-oriented and engagingly entertaining. The articles featured were often different from the norm, but still considered service as the content believed in its audience, and knew that women were interested in far more than just how to sew and cook, albeit those were valued topics as well. In the 1940s and 1950s, it featured many articles that covered subject matter that was also substantive and varied. 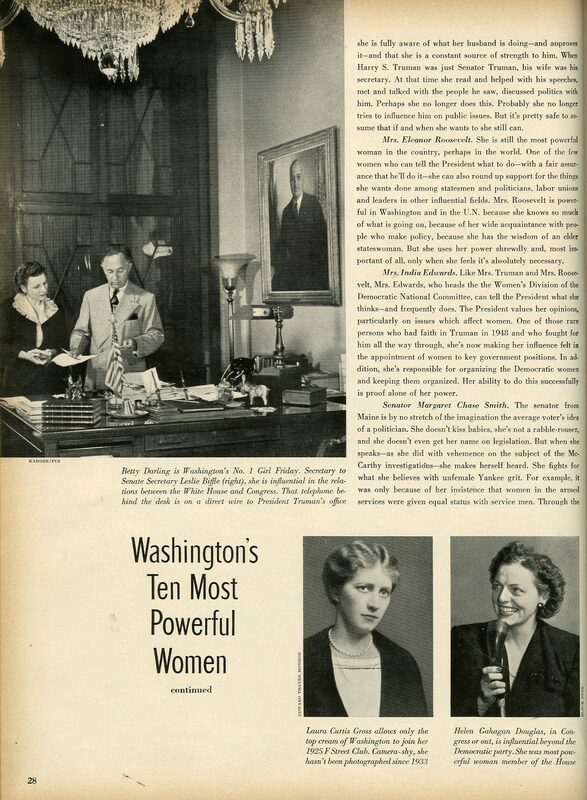 For example, the January 1951 cover story written by Doris Fleeson “Washington’s Ten Most Powerful Women,” was written at a time when most women only had power through men and the article stated as much. In fact, the byline in part reads: but the cold fact is that NO woman has power except through a man, quite a compelling and strong sentiment, especially for the era. 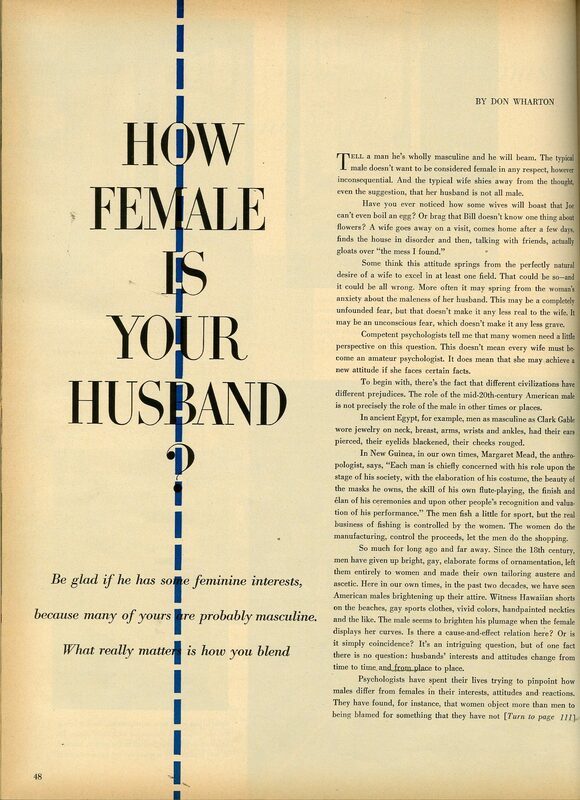 And then there were the contemplative features that made one think and consider, such as “How Female is Your Husband” written by Don Wharton. These types of articles were cutting edge for the times and comparatively magazines today could learn a few things from the masters who over 50 years ago were creating content that was so bulked with important and vibrant information, the magazine fairly groaned from its verbiage girth. In a good way, of course; that satisfied groan that many of us get when we finally push away from the Thanksgiving table. Can the newsstands be saved? How can you add value to your brand? Do you want to make more money in the magazine business? How can you maintain ink on paper in a digital age? Do you have problems with direct mail? Do you know how to launch your own magazine? From the smallest detail to the most major of decisions you might have to make? How to choose a printer? What about paper? 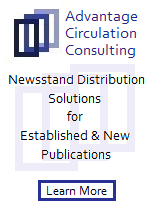 Do you know how to get your magazine distributed? Do you know how to make money with your magazine, real, actual revenue? And can you find Oxford, Miss.? Because if you can, all of the other questions that Mr. Magazine™ just asked can be answered with a resounding yes, if you attend the ACT 7 Experience at the Magazine Innovation Center on the campus of The University of Mississippi from April 25-27. We have gathered together industry leaders from each area of magazines and magazine media: editorial, publishing, printing, distribution and brand value; and we’ve brought them under one roof to share their ideas on everything “magazine.” From the launch to the first dollar you actually make on your publication. So, for less than $400, (and trust me, that’s far less than what it costs to produce a magazine) you can register below and be one of the elite 100 attendees who will hear these industry experts answer each of the questions I asked you in the introduction. Only 100 seats are available, so register today and be assured that you’re among the first ones seated. The sooner you register, the better the chances are that you will be able to attend this once-in-a-lifetime event. For travel and planning purposes the event starts at 6 pm on Tuesday April 25 and ends on 9 pm on Thursday April 27. Plan to fly into Memphis International Airport (a one hour drive from Oxford) and leave anytime on Friday April 28. The ACT 7 Experience continues on Wednesday, April 26, with Reed Phillips, CEO & Managing Partner, DeSilva+Phillips. Reed will talk about “How To Add Value to Your Brand Before You Sell It.” A concept that starts a dialogue and a checklist on what you need to know and do before you put your brand out there in the marketplace. 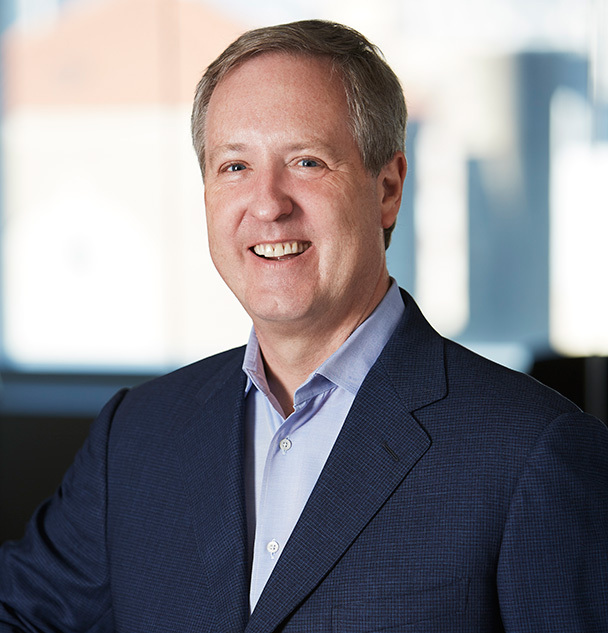 Reed Phillips is co-founder of DeSilva+Phillips, and one of the leading Mergers and Acquisitions advisor to media and marketing industries. DeSilva+Phillips have advised and invested in the industry on more than 250 transactions valued at over $8.5 billion. 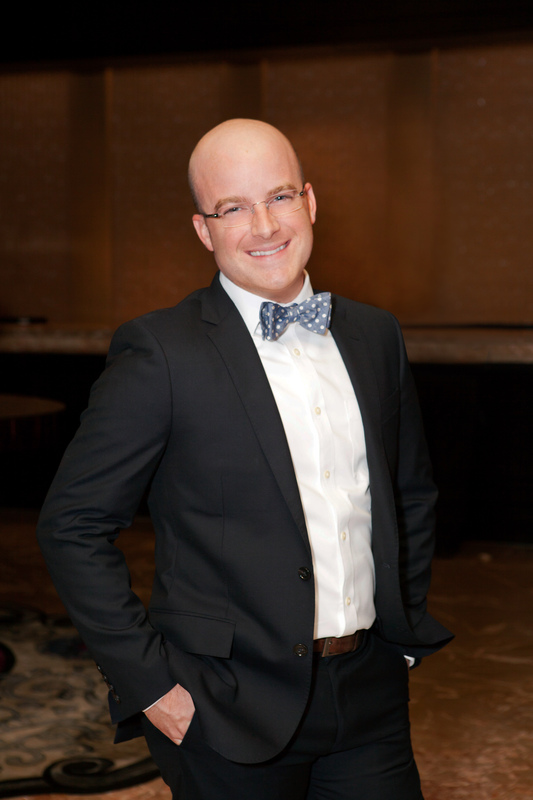 Reed specializes in magazines, events, marketing services, market research and information services. He has completed transactions with companies such as Bonnier Corp., Condé Nast, Dow Jones, IDG, Infogroup, News Corporation, TPG Growth, The New York Times Company, Rodale, Shamrock Holdings, Time Inc., Televisa and WPP. Reed was the winner of the 2007 Media Deal of the Year presented at ACG’s InterGrowth Conference by Mergers & Acquisitions. Currently, he is Oaklins’ Treasurer. Earlier in his career, he was founder of Fathers magazine, Associate Publisher of The New Republic, Vice President of The Washington Weekly and Circulation Director of The Washington Monthly. He also serves on the executive board of Oaklins International, the leading middle-market global investment bank, and is treasurer of the Foreign Policy Association. Owners of magazine media entities who are thinking or considering selling their brand, or just wanting to know how to add financial value to their brand are encouraged to attend. The morning of Wednesday, April 26 will continue to inform, engage and surprise attendees – so plan on joining us for ACT 7! Space is limited, so be sure to register here. We will bill you later. 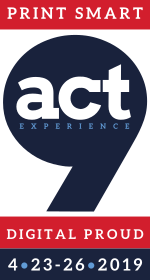 Stay tuned, more speakers, more programs at the ACT 7 Experience will follow. ACT 7 Experience will resume on Wednesday morning, April 26, with keynote speaker, Daniel Dejan, who will open up the ACT 7 Experience with a presentation on The Neuroscience of Touch: Haptic Brain/Haptic Brand, which unites neuroscience and branding to explore the many ways touch impacts how people perceive brands. An award-winning graphic designer, art/creative director, production manager and print buyer, Daniel Dejan is widely respected in the print communications industry as a graphic arts educator, author and consultant. As North American ETC, (Education, Consulting and Training), Print & Creative Manager for Sappi Fine Paper, Mr. Dejan provides value-added marketing, sales and technical consultation as well as in-house and end-user training and education for the print, paper and creative communities. Over the past 30 years, Daniel has written for various graphic arts publications. He served as technical consultant and a contributing writer for “The Designer’s Guide to Print Production.” Daniel is a Certified G7 Expert with a proficiency in Color and Color Management. 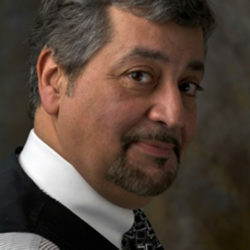 He has shared his expertise, presenting keynote addresses, seminars and workshops for AIGA chapters, the Printing Industries of America, Canadian Printing Industries, IDEAlliance, the IPA, the Spectrum Conference, Print Production Clubs and Art Directors Clubs throughout the US and Canada, National and International print, design and marketing events, conferences and symposiums, as well as in numerous presentations hosted by paper merchants, printers and corporations, all of which keep him on the road in excess of 200 days per year much to the chagrin of his family and pets. 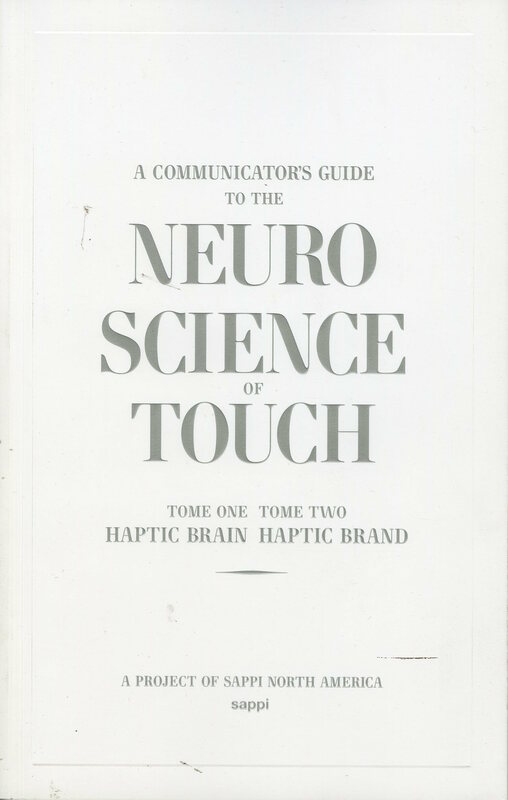 The Neuroscience of Touch is Sappi’s groundbreaking book, written in collaboration with renowned neuroscientist Dr. David Eagleman, and dives deeper into haptics, the science of touch. It explores why touch is such a crucial part of the sensory experience and how it influences emotion and decision making, establishing this sense as critical to any brand experience. More than half the human brain is devoted to processing sensory experiences. How things feel drives our thoughts and behaviors, influences comprehension, retention of information, and profoundly shapes our emotional connections. Daniel will explore haptics—the study of how our sense of touch shapes what we think in his Wednesday morning presentation and discussion. He’ll talk about companies that have built deep emotional connections by integrating touchable media into branded communications and shares guiding principles for all to use as touch points. It will be a great opening morning for ACT 7 – so plan on joining us there! Space is limited, so be sure to register here. We will bill you later. Hoffman Media Executives To Deliver Opening Keynote At The ACT 7 Experience April 25. 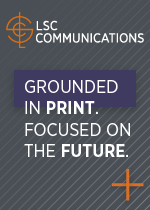 As ACT 7 gears up to begin its seventh year of Amplifying, Clarifying, and Testifying the power of print in a digital age, the esteemed and prestigious leaders in the world of all-things-magazine are also preparing to head to Oxford, Miss. for the event. This year’s opening ceremony will take place at the Inn at Ole Miss on the evening of April 25, and will bring a success story that only happens between the pages of magazines; or at least, because of them. Phyllis Hoffman DePiano, CEO of Hoffman Media and the recently named hottest magazine publisher of the year by Media Industry Newsletter and Mr. Magazine™, and her two twin sons, Brian Hart Hoffman, Chief Creative Officer, and Eric Hoffman, Chief Operating Officer, who are both the central reason she started all of this over 30 years ago with her sister and two close friends, will all three deliver the ACT 7 Experience keynote opening remarks at the gala dinner event. Suffice it to say, that what began as a Crafting & Needlework Village has become an epic women’s interest empire. The theme for the ACT 7 Experience is Magazines Matter, Print Matters, and the Hoffman’s can certainly attest and address that fact. Phyllis will be mapping the history and passion of Hoffman Media; Eric will speak about the business side of the company and the streams of revenue; and Brian will discuss the creative side and the many titles that manifest the core of Hoffman Media. It will be a rich and robust testament to the power of print, and the passion, creativity and vision of the Hoffman family. Hoffman Media is a company that is built on the foundation of family and creativity. 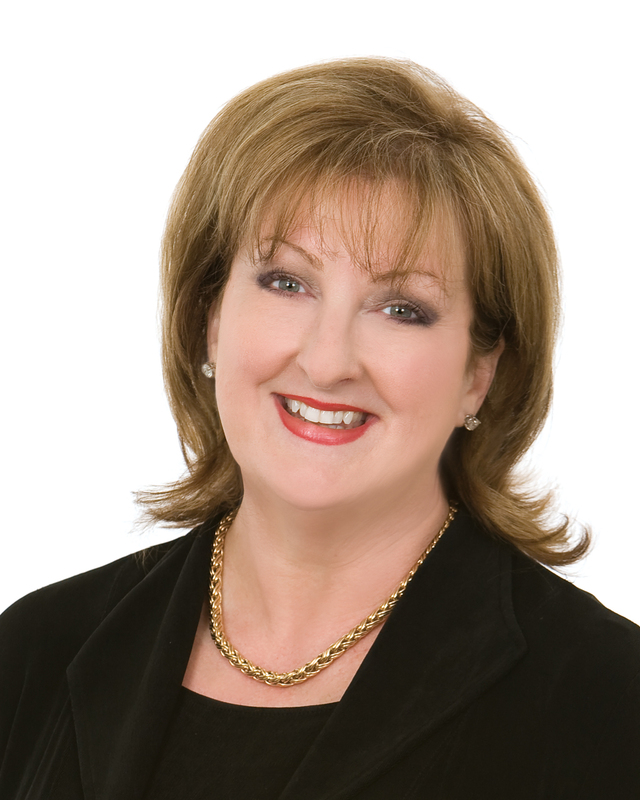 Since 1983 when Phyllis Hoffman DePiano founded the company as Symbol of Excellence Publishers, Inc., and later renamed it Hoffman Media in 1998, the company, which publishes a plethora of women’s titles, has experienced steady and often remarkable growth since its founding. Today, Phyllis is CEO of Hoffman Media, which is the No. 70 largest private firm in Birmingham, Ala. and is No. 4 of the top women-owned businesses, based on total revenue in 2012, according to the Birmingham Business Journal’s List. 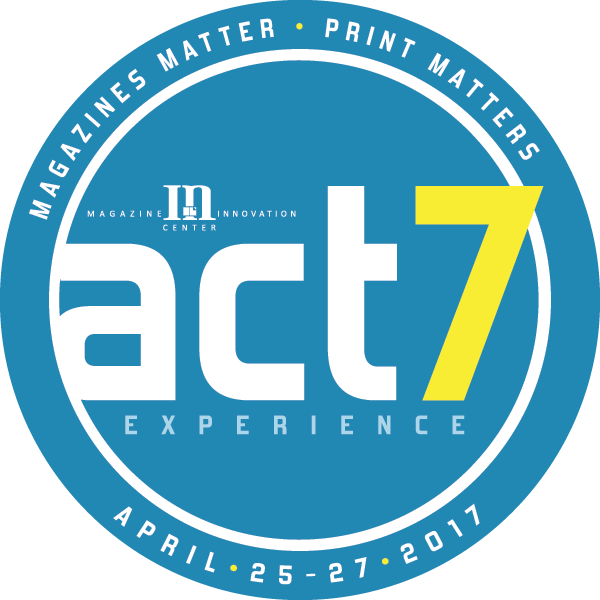 So, join us for ACT 7, April 25-27, 2017 at the Magazine Innovation Center, located at the Meek School of Journalism and New Media on the campus of the University of Mississippi. It’s sure to be an exciting time in the world of magazines and magazine media that you won’t want to miss. And keep an eye out for more exciting name-dropping about the who’s-who speaker list here on Mr. Magazine’s™ blog in upcoming weeks as we get closer to ACT 7. Space is limited to 100 attendees, so the sooner you register the better the chances are that you will be able to attend this once-in-a-lifetime event. Click here to register. 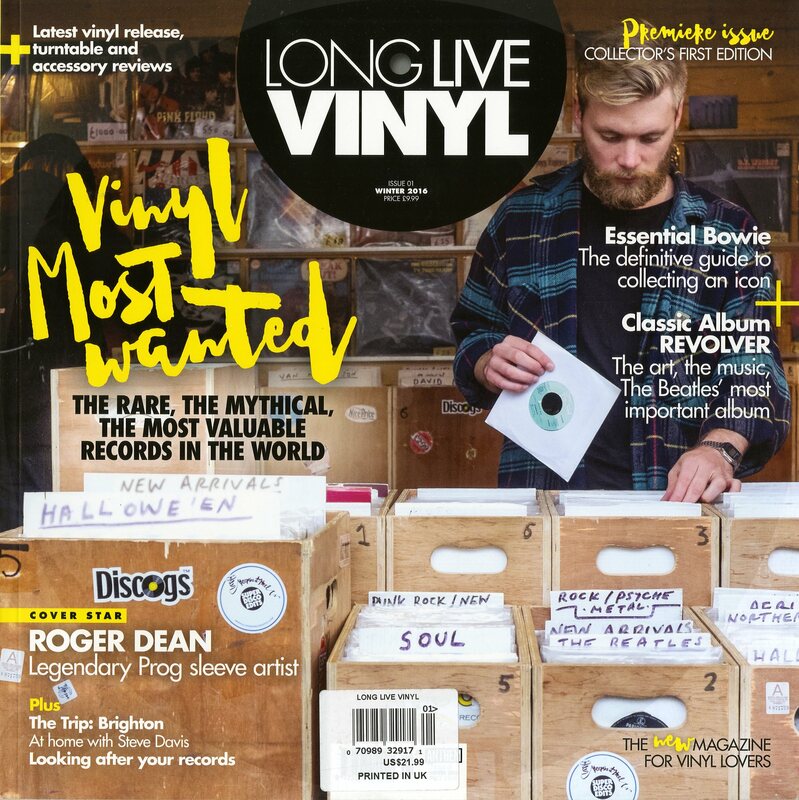 Long live print and vinyl – that seems to be the mantra of a new British magazine that recently had its premier issue. Long Live Vinyl is an absolutely gorgeous addition to the world of ink on paper. The magazine is featured in a spectacular 12-inch collectable size, bringing back those fond memories of albums and their great covers, and celebrating the vinyl format. It’s printed on high quality, heavy paper and looks and feels amazing. So, just when you thought vinyl went extinct with the last Def Leppard album you bought, let me remind you, the naysayers were spouting the decline and death of print the minute the first pixel hit a screen – it didn’t happen. So, dust off your stereos and turn up the volume; print and vinyl are back together in a great new magazine! Bob Althoff is a self-proclaimed enthusiastic evangelist. He is an evangelist for Powersports, for the dealers of those products that fall beneath that umbrella, motorcycles, especially Harley-Davidson’s, and he’s an evangelist for the people who buy them. He is a man who owns the oldest Harley-Davidson dealership on the planet, and now he is the proud steward of the 50-year-old Dealernews magazine that folded in December, 2015. The only difference is Bob is presently concentrating on the immediacy of digital in order to keep the community of dealers informed and connected throughout the industry. I can honestly say that I have never spoken with a more genuine and sincere human being in my life. I talked with Bob recently and we discussed his plans for dealernews.com and his hope that someday he will once again have an ink on paper component in the marketplace to help uplift the industry. Bob’s plan is to make dealernews.com the resource that he feels every dealer and retailer, customer and Powersport enthusiast, needs and he’s already seeing positivity from peers and colleagues in the industry. Bob, along with his wife, Valerie, acquired A.D. Farrow in 2003. Under Bob’s leadership, A.D. Farrow expanded from its single, historic downtown store to three thriving dealerships in the greater Columbus, Ohio area, and won Top 100 Dealer honors for 11 of the last 12 years. Bob has been riding motorcycles for more than 50 years. An avid industry historian, he acquired the Heroes of Harley-Davidson exhibit from the American Motorcyclist Association, and maintains the valuable Motor Co. archive on the A.D. Farrow website. Bob is also the 2013 recipient of the Don J. Brown Lifetime Achievement Award, recognizing his lifelong dedication to the business, lifestyle, community and sport. So, I hope that you enjoy this Mr. Magazine™ interview with a man who believes in balance throughout his entire life, and strives to implement it evenly, Bob Althoff. On how he got into the magazine publishing side of the Harley-Davidson business: To be honest with you, when Dealernews was shut down by its British parent, UBM, it was done on the publication of our 50th anniversary issue. That occurred in December, 2015. And as a dealer, I will just tell you that Dealernews is where I learned from other dealers; where I was inspired by their good works; it was where we competed with one another for honors. And when this void was created it was a moment that I just said to myself how can a $24 billion industry that is not represented by an industry association; we do not have an analog to the NADA (National Automobile Dealers Association) in Powersports, and there are 9,500 dealers, large and small, all over North America that are left without service. And that’s just not acceptable. So, I acted on that. On whether he thinks Dealernews’ parent company, UBM, shut the magazine down due to an overreaction about the death of print: In this case, Advanstar, which was the owner of Dealernews, sold itself in December, 2014 to UBM, which is out of the British Isles, for almost $1 billion. Their primary business is expositions. Advanstar was the owner of Magic, which is the largest fashion exposition in the United States and one of the largest in the world. So, clearly there were assets there that were worth a lot of money. It’s just that UBM decided that expositions were the be all and end all, and that the publication of Dealernews in our industry was not going to be a part of their future. On what he has been doing since he acquired Dealernews: Since our acquisition in May, we’ve been very busy taking those assets, which amounted to lists of our industry players and all of the contact information that was all cleaned up at a great deal of time and expense; we have certainly the best records now that exist anywhere. We’ve gotten our website, which was extremely expensive. We brought it over to new webhosting and we’ve updated it dramatically. But it’s quite an archival treasure trove, with, as you might imagine, print records that go back 50 years. There are literally 10,000 how-to articles in there. So, we’ve been busy reengaging and relaunching the Dealernews brand. On the early reaction he’s received from his colleagues in the industry: It’s been nothing short of phenomenal. We very quickly tried to reach out to some gray beards in the industry, which have great credibility and said look, we need your advice and guidance. And we have a stellar advisory board that has been empaneled. Virtually, no one turned us down on that. On whether he has plans to bring back the printed magazine to the marketplace: Initially, we have to focus on the digital because; number one, it’s the immediacy of it. The dealers need that first and foremost. We would love to be back in print and I suspect that in due course we will be. Certainly, hopefully, with our Dealernews Top 100; this is our industry’s most prestigious competition, and highlights those 100 best retailers in North America. Also with buyer’s guides, annuals and that sort of thing, but to go back to a monthly print; I think that will take us a while. We’ve got some work to do to get relaunched and reengaged. On the most challenging moment he’s facing and how he plans to overcome it: The most challenging really is the macro environment. Our customers have to have jobs and they have to have discretionary income, and they have to have enough confidence to make that discretionary purchase. The great thing about our final market is that everyone wants a motorcycle. It’s just that they don’t want it now. My job as a retailer is to uncover what exactly that reluctance is and try to address it. On the lack of community among dealers: People think we sell motorcycles, but we are really cultural institutions. As dealers in a local market, large or small, we’re the glue that holds those bikers together in that firm fraternity or sorority or kinship. We’re seven-days-per-week; we’re busy being available to our customers in their leisure time, and so I will tell you this, for the last 15 years I’ve worked seven days per week to try and serve those customers of mine. On anything else he’d like to add: You can see the vacuum into which we are really stepping here. And I think you can understand how passionate we all are about the work that we do and the impact that it has on our communities and the impact that our writers have on the larger community. We have a great story to tell, and what we have to do is find a way to be able to tell that story so that it ignites not only the dealers, but our customers around the brick and mortar and the gatherings and the social. Customers are looking for some release, recreation, identities and opportunities to pursue their charitable inclinations, and so you can see how important this work is and you can see why Dealernews is so important. On what someone would find him doing if they showed up unexpectedly to his home one evening: I am a voracious reader. I do lecture at Ohio State University at three or four levels: MBA, Executive MBA and Undergraduate Honors. I am consumed by this great industry and I’m very blessed to do the work that I do. But all of this is at risk, and so that’s what I do. I get up very early and I’m 67-years-old now; I go to the gym and I come in here and I try to keep this business healthy. And obviously now I have a new hat that I wear, but as difficult as things are and as big a challenge as this is, I’m driven like most of the people who work for me and most of the people in our industry, and that is that we have a great passion for this. And we know it’s important, so we do what we do. On how he balances his passion with business: I am an enthusiastic evangelist for all of the good things that motorcycling has brought to me in my life. I’ve ridden motorcycles all over the world; I have made great friends; I’ve had great adventures, and I’ve had great misadventures. My marriage is stronger because my wife and I ride together. I don’t go to the golf course and she doesn’t go to the tennis club. We ride together. I believe God put me on earth to do the work that I’m doing and I’m just blessed. On what keeps him up at night: If I died tomorrow, and I could write my own epitaph, it would say on my tombstone: He led a balanced life. I don’t want to be the best husband, because if I were I would be at home right now feeding my wife bonbons and attending to her luncheon menu. I don’t want to be the best spiritual person, or the best businessman, or the best father, or the best citizen, but I’d like to think that I’m a little bit good at all of those things. And that’s why I worry sometimes the demands of my business are keeping me from being as balanced as I would prefer to be. And now the lightly edited transcript of the Mr. magazine™ interview with Bob Althoff. Samir Husni: I know you’re an avid motorcyclist, and you have the dealership, but what got you interested in the publishing side of this business? Bob Althoff: I’m blessed to be the steward of a 105-year-old dealership; the oldest Harley-Davidson dealership on the face of the planet. I represent a storied, American brand. I’ve been a motorcyclist since the morning I turned 16-years-old, so now that’s been 50 years. I was fortunate enough to turn my avocation into my vocation some 15 years ago when I bought this business. And to be honest with you, when Dealernews was shut down by its British parent, UBM, it was done on the publication of our 50th anniversary issue. That occurred in December, 2015. And as a dealer, I will just tell you that Dealernews is where I learned from other dealers; where I was inspired by their good works; it was where we competed with one another for honors. And when this void was created it was a moment that I just said to myself how can a $24 billion industry that is not represented by an industry association; we do not have an analog to the NADA (National Automobile Dealers Association) in Powersports, and there are 9,500 dealers, large and small, all over North America that are left without service. And that’s just not acceptable. So, I acted on that. It’s not any grand design; it is simply that there is an important thing here. It’s important to me and it’s important to these other men and women, and it’s important to our customers, some nine million active American motorcyclists. So, here we are. Samir Husni: In the marketplace, there are a lot of motorcycle magazines that serve the customer, rather than the retailer. The newest that came is one for people who are both in the army and motorcyclists. So, there is a market there for these types of magazines. Do you think the publishing industry overreacted to the death of print and became more fascinated with all things digital? Bob Althoff: In this case, Advanstar, which was the owner of Dealernews, sold itself in December, 2014 to UBM, which is out of the British Isles, for almost $1 billion. Their primary business is expositions. Advanstar was the owner of Magic, which is the largest fashion exposition in the United States and one of the largest in the world. So, clearly there were assets there that were worth a lot of money. It’s just that UBM decided that expositions were the be all and end all, and that the publication of Dealernews in our industry was not going to be a part of their future. So, they walked away from it, lock, stock and barrel. I’m not sure exactly what the motivations were; you would know better than anyone the problems that have beset the print industry, and the disruption of the microcosm that this has caused. As a consumer of this very important information resource, I just couldn’t sit by and say OK – game over; we now no longer have that nexus where we can speak to one another, where we can learn from one another, and where we can be an industry. This is a pure B to B effort; obviously, this is of, by and for dealers. We now no longer have a corporate master in the sense that there will be no lack of clarity about what we’re doing or who we’re serving. And we’re going to try and lift our industry. It’s an industry that has been under some assault. We sell highly discretionary products, they are big ticket and they require a bank loan many times. Our industry, therefore, is deeply cyclical. But as I said, it’s a 105-year-old business that I am charged with and I felt like this was an important thing to do, so we’re off and running. Samir Husni: What have you been doing since you acquired the brand? Bob Althoff: Since our acquisition in May, we’ve been very busy taking those assets, which amounted to lists of our industry players and all of the contact information that was all cleaned up at a great deal of time and expense; we have certainly the best records now that exist anywhere. We’ve gotten our website, which was extremely expensive. We brought it over to new webhosting and we’ve updated it dramatically. But it’s quite an archival treasure trove, with, as you might imagine, print records that go back 50 years. There are literally 10,000 how-to articles in there. We have put some embellishments in that website. We have a paywall behind a paywall, so we’re going to be providing some interesting new engagement tools to our almost 10,000 dealers. We just went back into action with the website in the last month, and we’ll be relaunching our Dealernews Alerts, which is a blast email that goes out to the trade twice a week. And we’ll be doing that within the next week. So, we’ve been busy reengaging and relaunching the Dealernews brand. 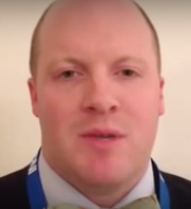 Samir Husni: What has been the early reaction from your colleagues in the industry? Bob Althoff: It’s been nothing short of phenomenal. We very quickly tried to reach out to some gray beards in the industry, which have great credibility and said look, we need your advice and guidance. And we have a stellar advisory board that has been empaneled. Virtually, no one turned us down on that. We have announced ourselves not only to the dealers who we serve, but also to the manufacturers who produce this product for us to sell to the public. And we are getting some traction there. I will say that it’s been a little slower on the uptake, but there is obviously some concerns that they have about how exactly this tool will be used in the hands of dealers. We’re assuring them that we’re going to lift this industry and we’re going to help tear down some of the silos that have been created and be of service, ultimately, to the retail customer because retail excellence is what drives final demand and ultimately that’s what drives $24 billion worth of commerce. So, we can’t lose sight of the customer and the best ways to serve that customer. As that message has went out, I think it’s been really terrific. Now I won’t tell you that it’s not a chore to get hold of and be able to explain all of this to all of the players in our industry. Obviously, we have a pipeline to the dealers, but the rest of the industry has to hear about this with phone calls and personal contacts and so forth. It’s a little more time-consuming. Samir Husni: Do you think that you can accomplish that with just the website; with the virtual? Or do you have plans to bring back the printed magazine into the marketplace? Bob Althoff: Initially, we have to focus on the digital because; number one, it’s the immediacy of it. The dealers need that first and foremost. We would love to be back in print and I suspect that in due course we will be. Certainly, hopefully, with our Dealernews Top 100; this is our industry’s most prestigious competition, and highlights those 100 best retailers in North America. Also with buyer’s guides, annuals and that sort of thing, but to go back to a monthly print; I think that will take us a while. We’ve got some work to do to get relaunched and reengaged. So, right now for us, I think that the focus is to give the dealers what they need and quick bursts of information; explain to them the engagement tools, which will allow them to go into our website and go back behind these various paywalls to places where they can identify one another by geography, brand, problem or opportunity, and communicate with one another in confidence. They will have a public presence in that website, which will be out there and available to the general public, where we will extol the virtues of the good work being done by these men and women and their charitable endeavors in their communities. Generally, we’ll be doing community building, so that’s the first focus. There are also some fun things that we can be thinking about that might provide some economic sustenance and would support us getting back into print, and those things are going to be along the lines of some other information services. Perhaps, on-demand online training for our staff, and there are a few other ideas that we have up our sleeve. To be honest with you, as I look at the landscape, I look at it from two standpoints. One, as an advertiser I’m at sea because I don’t know whether the world is really changing and I should place all of my bets on the electronic delivery, or whether it should be balanced with print, or whether I should even be in print. And as a result, I look at the Washington Post and I say they might not even be in print if Jeff Bezos hadn’t made a little money with Amazon. So, I’m going to just learn and watch people like you, and hopefully we’ll rebuild this iconic masthead that is Dealernews. Samir Husni: As you bring that trust of the brand back to life, what do you think is going to be your most challenging hurdle, and how do you plan on overcoming it? Bob Althoff: The most challenging really is the macro environment. Our customers have to have jobs and they have to have discretionary income, and they have to have enough confidence to make that discretionary purchase. The great thing about our final market is that everyone wants a motorcycle. It’s just that they don’t want it now. My job as a retailer is to uncover what exactly that reluctance is and try to address it. This is the biggest challenge confronting our industry; it’s the biggest challenge confronting dealers, and it’s put us all under a great deal of economic pressure. So, clearly that is the biggest challenge. Now secondarily, it is dealers have never really had the opportunity to be an industry; it’s a lonely place being a Powersports dealer in North America. You are serviced by your OEM (original equipment manufacturer) with information, but the OEM has a certain, very pointed opinion about things, and your ability to interact with fellow retailers around some of the subjects that we’ve just discussed has been extremely limited, if not zero. Think about the 14,000 discreet industry associations that are out there; they’re all serving their audiences in great ways. Some better than others, but at least those associations exist and they exist as information exchanges and share best practices, what have you. We’ve never had that. So, dealers are going to have to understand that a) we’re here, b) we are of them, by them and for them, and the rest of the industry is going to have to understand that we’re going to be a positive force to try and lift all boats onto a rising tide. Samir Husni: When I think of motorcycles, I think of clubs, groups and communities, so I am surprised to hear that there isn’t that community among dealers. Bob Althoff: Well, you’re right; you hit the nail on the head. People think we sell motorcycles, but we are really cultural institutions. As dealers in a local market, large or small, we’re the glue that holds those bikers together in that firm fraternity or sorority or kinship. We’re seven-days-per-week; we’re busy being available to our customers in their leisure time, and so I will tell you this, for the last 15 years I’ve worked seven days per week to try and serve those customers of mine. So, part of it is just that dealers are busy, and they’re busy leading and sometimes following those communities, but those communities are very, very solid. It’s just that for whatever reason, an accident of history, we are a vastly underserved industry from that standpoint. I hope that Dealernews can begin to provide some of that glue that will make us all better at serving those great customers. Samir Husni: Is there anything else that you’d like to add? Bob Althoff: You can see the vacuum into which we are really stepping here. And I think you can understand how passionate we all are about the work that we do and the impact that it has on our communities and the impact that our writers have on the larger community. We have a great story to tell, and what we have to do is find a way to be able to tell that story so that it ignites not only the dealers, but our customers around the brick and mortar and the gatherings and the social. Customers are looking for some release, recreation, identities and opportunities to pursue their charitable inclinations, and so you can see how important this work is and you can see why Dealernews is so important. Wish us luck, say a prayer for us and we’ll be watching you and your website to see what we can learn there. Samir Husni: If I showed up unexpectedly one evening to your home, what would I find you doing; reading a magazine; riding your motorcycle; having a glass of wine; or something else? Bob Althoff: It’s certainly not the latter; my wife and I are now 11 years without a drink. But I certainly do love my motorcycle, and I will tell you that there is a little bit of tyranny involved in what I do and that is that the Cobbler’s kids have no shoes. All of my waking hours are really involved with all of the things that we just talked about. I am a voracious reader. I do lecture at Ohio State University at three or four levels: MBA, Executive MBA and Undergraduate Honors. I am consumed by this great industry and I’m very blessed to do the work that I do. But all of this is at risk, and so that’s what I do. I get up very early and I’m 67-years-old now; I go to the gym and I come in here and I try to keep this business healthy. And obviously now I have a new hat that I wear, but as difficult as things are and as big a challenge as this is, I’m driven like most of the people who work for me and most of the people in our industry, and that is that we have a great passion for this. And we know it’s important, so we do what we do. Samir Husni: How do you balance your passion with your business? How do you balance the relationship between your heart and your brain? Bob Althoff: That’s a great question and I’ll just tell you this, 100+ years ago when the founders of our company, Harley-Davidson, got together and formed this company, they had a company, House Morgan, it was called The Enthusiast. It was not called The Realist; it was not called The Pessimist; it wasn’t called The Pragmatist; it was called The Enthusiast. 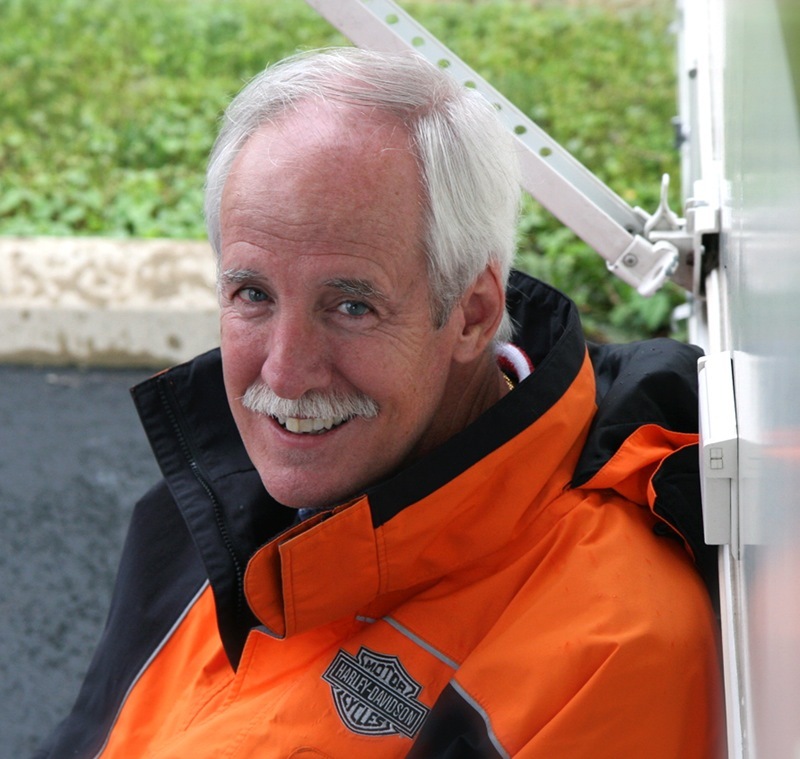 I am an enthusiastic evangelist for all of the good things that motorcycling has brought to me in my life. I’ve ridden motorcycles all over the world; I have made great friends; I’ve had great adventures, and I’ve had great misadventures. My marriage is stronger because my wife and I ride together. I don’t go to the golf course and she doesn’t go to the tennis club. We ride together. I believe God put me on earth to do the work that I’m doing and I’m just blessed. Every morning when I walk up to one of my buildings, I take a moment and I just stop and look at the building. I try to see it with new eyes and I try to remember that we can change people’s lives. We do it all of the time, in small ways and in large. It’s a unique business that allows passion to be unbridled and to show the way, because ultimately people have their reluctances; our riders and breadwinners, they’re supporting multigenerational families; they’re hard workers; their police and firemen and military. And now increasingly, it’s a clubhouse that everyone is invited into. We have women who are buying motorcycles for themselves and we’re proud of that. My only problem is that there isn’t 72 hours in every day. Samir Husni: My typical last question; what keeps you up at night? Bob Althoff: If I died tomorrow, and I could write my own epitaph, it would say on my tombstone: He led a balanced life. I don’t want to be the best husband, because if I were I would be at home right now feeding my wife bonbons and attending to her luncheon menu. I don’t want to be the best spiritual person, or the best businessman, or the best father, or the best citizen, but I’d like to think that I’m a little bit good at all of those things. And that’s why I worry sometimes the demands of my business are keeping me from being as balanced as I would prefer to be. That’s my honest truth. When I said that I wished that I had more hours in a day, it’s for that very reason. When I was driving to work today, I was thinking that I have two daughters, one in California and one in Ohio, and my wife, all of whom would love to get some flowers from me today. And here it is halfway through the day and I haven’t had time to do that. Like a lot of people who are similarly situated, to whom much is given, much is expected. There’s a lot to do every day, that’s for sure. That would be what keeps me up at night. You are currently browsing the Mr. Magazine blog archives for January, 2017. Mr. Magazine™ Consulting & Research, Inc.
James and Lisa Cohen: Putting Their Money Where Their Mouths And Passions Are. The Launch Story Of Galerie Magazine And The Role And Future Of Print & The Newsstands In A Digital Age – The Mr. Magazine™ Interview With The Owners Of Hudson News Distribution Company and Founders Of The New Galerie Magazine. John L. Walters: The Editor Who Keeps An “Eye” On Graphic Design Worldwide. The Mr. Magazine™ Interview.